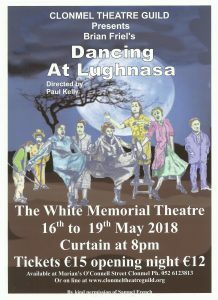 Clonmel Theatre Guild proudly present Brian Friel’s “Dancing at Lughnasa” to be staged in the White Memorial Theatre on 16th-19th May 2018. 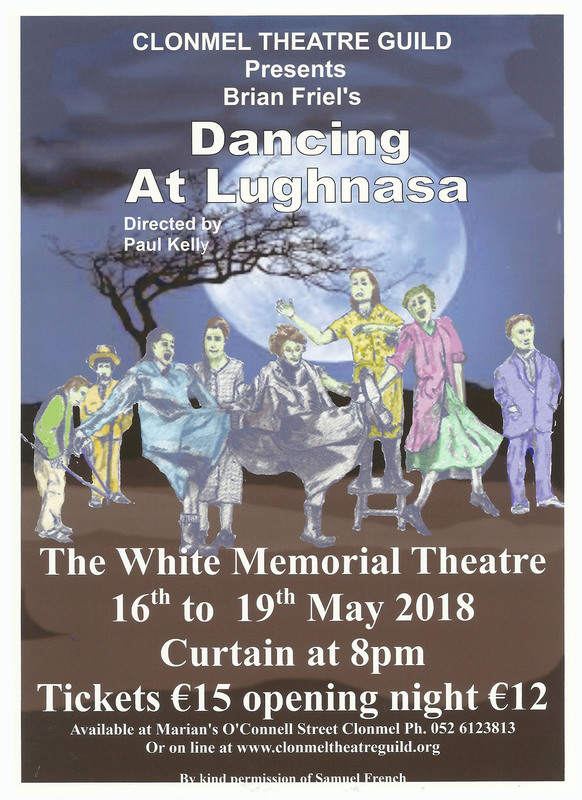 “Dancing at Lughnasa” is loosely based on the lives of Friel’s mother and aunts who lived in Glenties, on the west coast of Donegal. Set in the summer of 1936 in the fictional town of Ballybeg, the play depicts the late summer days when love briefly seems possible for three of the Mundy sisters (Chris, Rose, and Kate) and the family welcomes home the frail elder brother, who has returned from a life as a missionary in Africa. However, as the summer ends, the family foresees the sadness and economic privations under which they will suffer as all hopes fade. The play takes place in early August, around the festival of Lughnasadh, the Celtic harvest festival. The play describes a bitter harvest for the Mundy sisters, a time of reaping what has been sown. Tickets priced at €15, with the opening night priced at €12, go on sale in Marian’s Bookshop, Clonmel, tel. 052 6123813 on Tuesday 2nd May and are currently available online on this website. A donation will be made to River Suir Suicide Patrol. We look forward to seeing you there. If being a part of this production backstage interests you, please contact us. We welcome all.